Busy packing supplies for shipment at CSTCF Headquarters, London, Ontario. 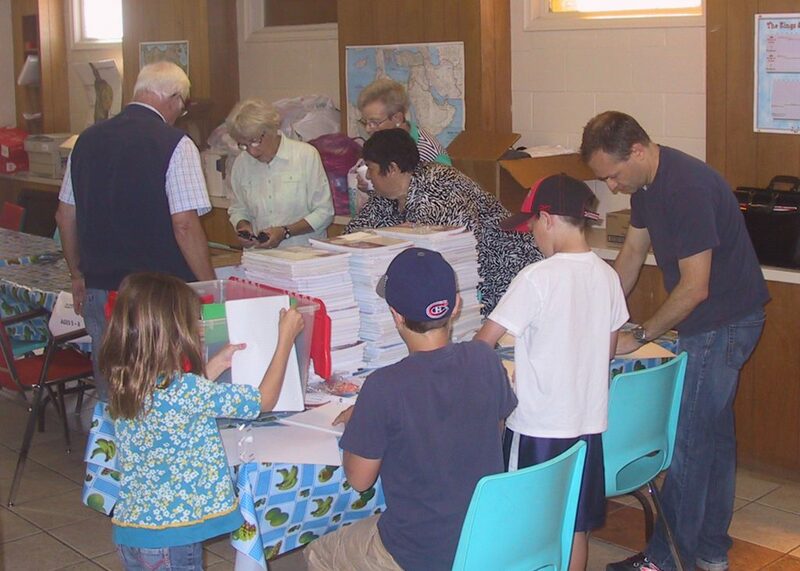 The London, Ontario, Canada ecclesia was blessed to move into their own hall which contained an independent “house”, albeit 80 years old but sound in body and fervent in spirit, which was outfitted by willing labour to contain enough supplies for at least 2000 children. Rooms were designed to create storage space, working rooms for collating, compiling, preparing orders, storage of donated clothing and our newly added “used book library” for any ecclesias or Sunday Schools to avail themselves of these resource references through linkpersons, Sunday school and CYC leaders. Do what you can, from wherever you are, with whatever you have – just do it. The walls were decorated by young people with positive motivational verses and one of the walls contains a plaque with stones on it. It’s history goes back to the week that we moved into our hall and cleaned up the house due to its decrepit state. During our cleaning process we removed neglected bush and badly tended gardens and inside of the garden beds we found three stones marked with the words “Faith” “love” “Believe”. One young 8 year old stated “I think God is trying to tell us to fix this house for the children”. Stunned by the wisdom of such a young person, with prayer we resolved to remodel the house to contain the CSTCF and its contents that were previously stored in “unheated, limited capacity storage units”. God provides the way for barriers to be removed. The only barrier that remains is our inability to see the vision, care, work and do. Bro. Bob Lloyd once said “Do what you can, from wherever you are, with whatever you have – just do it”.